San Juan Mountains Association volunteers hang out at the 2005 National Public Lands Day event. 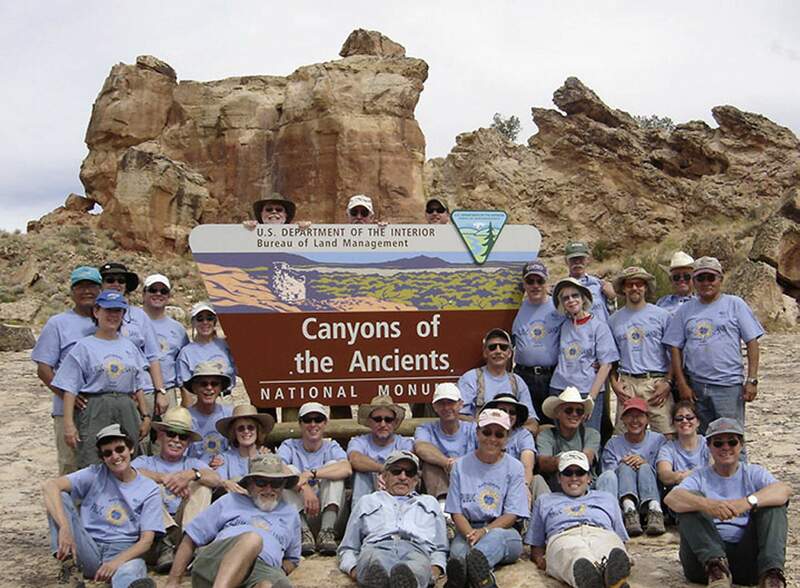 This year, San Juan Mountains Association celebrates 30 years as the interpretive support partner for the San Juan National Forest, the Bureau of Land Management, Tres Rios and BLM Canyons of the Ancients National Monument. These partnerships stemmed out of the need for connecting people with the land and creating a link between the land managers and the community in order to develop stewardship opportunities. Recently stated by Ed Zink, one of the founding fathers, “Back then we didn’t dream big enough; SJMA has exceeded all expectations.” Since 1988, we have grown from a handful of volunteers and hundreds of hours to more than 700 volunteers and thousands of hours per year. SJMA is truly a grass-roots volunteer organization with similar passions and values for our public lands and cultural treasurers. We are dedicated to helping people discover unique places, opportunities and experiences that might not be otherwise available to the public. SJMA is your gateway to help you experience, learn about, enjoy and care for the lands we all love. We had our humble beginnings in the Forest Service building in Durango (now referred to as “The Commons”) with a small bookcase of books and maps to sell to the public. We now have 14 bookstore outlets throughout the San Juan, Rio Grande and Uncompahgre national forests and serve more than 1 million customers per year. Not only does SJMA provide books, maps and interpretive items, but unparalleled visitor information. Our beginnings also included a small group of volunteers assisting the Forest Service with maintaining the integrity of Chicago Basin in the Weminuche Wilderness. Today, we have thousands of volunteer hours protecting all the wilderness areas through our Wilderness Information Specialists program. In 1988, Tess Stransky led the Conservation Education program, teaching our young people the importance of conservation and giving back to the land. Our youth service program inspired what is now the Southwest Conservation Corps that empowers people to positively impact their lives, their communities and the environment and serves the entire Four Corners and more. Today, our Conservation Education program educates more than 1,000 children a year and provides hands-on opportunities for youths to be involved on our public lands. Young people are learning about natural resources, how to backpack and appreciate the outdoors, and how to give back to our public lands. College students are spending time volunteering on public lands during their spring break instead of going to beaches and parties. The volunteer program has also grown over the past 30 years. SJMA provides adults and young people opportunities to give back through a variety of programs such as Adopt a Road, National Public Lands Day, National Trails Day and Colorado Public Lands Day. Each event and program has grown throughout the years and is serving the needs of public land managers and our beautiful landscape. We are on track this year for 13,000-plus volunteer hours. Our award-winning Cultural Program provides hands-on opportunities to study the history of our landscape and learn how to respect and protect what we have through documenting and monitoring the special cultural sites in the area. What does the future hold for SJMA? Well, that depends on you. We need to increase our membership enrollment and expand our funding sources so that we can continue all the good work of the past 30 years. Visit sjma.org to learn more and become a member. Please join SJMA at the Durango & Silverton Narrow Gauge Railroad Grange Hall on Sept. 20 for our 30th anniversary celebration. We’ll have food, fun, a silent auction and entertainment. Reservations may be made at https://sjma30th.eventbrite.com or by calling 385-1210 and leaving a message.